In 2017, Sofie Valk started in her current position as a postdoctoral researcher at the Heinrich Heine University, Düsseldorf and the Research Centre Jülich in Germany. Her son Isaak was born the year before, in 2016, while Sofie was completing her PhD in Leipzig, Germany. Sofie with Isaak, just after her PhD defence. Image credit: Marjan Sharifi. How did you become both a parent and a scientist? When Isaak was born in 2016 both my partner and I were working on our PhDs at the Max Planck Institute for Human Cognitive and Brain Sciences in Leipzig, Germany. The timing was in a strange way very good, as my mother could meet her grandson before she passed away just before the end of my PhD. After my PhD, we moved to Cologne so that I could start a postdoc position in Jülich Research Centre and continue doing science. My partner started working as a medical resident in the hospital. When you work in Germany both parents can share a total of 14 months full-time maternity and paternity leave. Both my partner and I each took about four months off after Isaak was born. 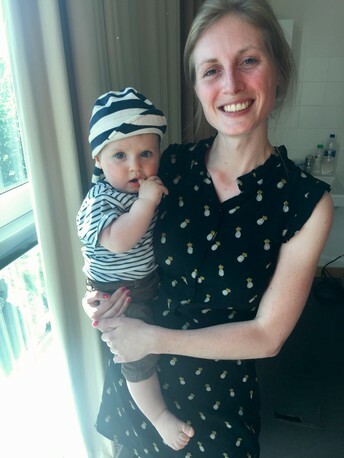 Through the Max Planck day care cooperation, Isaak could go to a day care close to the Max Planck Institute starting when he was about seven months old. 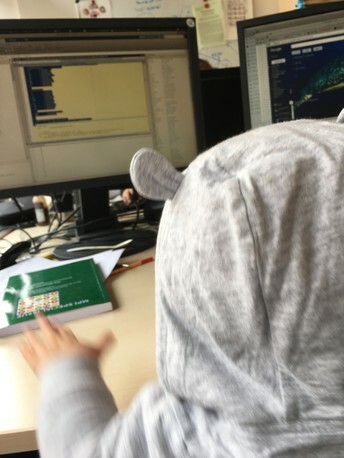 At my current workplace in Jülich Research Centre and Heinrich Heine University Düsseldorf, my boss is very understanding of being a scientist and parent, and I can work flexibly from home if needed. Given much of my work just needs a computer, this way, I can still get enough work done. Besides support from my workplace, friends who already had children helped us by lending us baby clothes and toys. Our family lives relatively far away, so they do not play a big role in our day-to-day lives. They are supportive of our choices, but sometimes sad they do not see their grandson more often. I would not like to say that the balance is difficult, because for us it is how we want our life. Of course, the balance includes frustrations and struggles, as would other life choices. The most difficult part is the lack of time, and I’ve had to learn that I cannot do everything. It can be stressful to be away for work and trying to soothe a crying child over the phone at 2:00am. Or having a teething child when you need to submit your thesis in a week. Also, I often have to say no to many things I’d like to be part of, such as outreach activities, visits abroad, or dinners with guest scientists, because I have no time. It would be great if all institutions, universities, and conferences had with enough affordable day care options. Also, not only women with children, but also men should be more supported and encouraged to spend time with their family. In general, short-term contracts are a challenge and for many reasons it would be good if this would change. Personally, I am really happy with my science life and enjoy working, but sometimes it makes me sad to defend my choices to people that expect women to be at home with their child. Isaak 'doing matlab' at Sofie's office. Image credit: Sofie Valk. What advice would you give to other scientists who are thinking of having children? Set your goals clearly and accept that when you want many things, it all might take a bit longer. For me science and parenthood go together well (so far). For me getting my son in my PhD was a blessing, first because he is a great kid, but also because this way my career and my family can “grow up” together. Also, my son keeps me grounded and helps me to focus on the right questions. How do you think being a scientist and a parent compares with working in another profession as a parent? I think all professions have their pros and cons. In science, one has to be curious and have original ideas. A child can contribute to that – if you are not lacking too much sleep. From what I have experienced, being a (junior) scientist means I am more flexible to work from home or take care of my child when he is sick. However, other professions might give more long-term job security. When I compare it to my partner’s work in the clinic, I see that he struggles in a different way to make it work to be both a parent and a medical doctor. Patients don’t wait, and his work hours are more challenging to combine with having a young child.